WITH PROPER training and socializing, the Rottweiler can be a great family pet, companion, herding dog, tracking dog, obedience dog, etc. They are very loyal, dedicated, loving, beautiful and intelligent. As a rule they do not bark a lot unnecessarily and they are generally good watch dogs who will let you know when something's up. With proper training and socializing they will enjoy and participate in nearly any outdoor activity you desire. At the same time, WHEN MATURE, a WELL EXERCISED Rottweiler is a very sedate house dog that wants nothing more than to sleep on the bed or chew on a Nylabone. However, they are not perfect and do have their down sides. They are not mature until after 2 years of age and the average life expectancy is only 8 - 10 years. They are very susceptible to a wide range of cancers and they have a poor immune system (particularly when young) and need a more specialized vaccination schedule as a puppy in order to develop proper immunity. They are also prone to contracting more viruses than the average dog, especially when fed improperly. They are susceptible to hip dysplasia, tearing cruciate ligaments and heart problems as well as cancer. They are strong willed and need LOTS of PROPER training and socializing when young. IF you fail in your duties to select, train and socialize them properly, they can be dangerous (sometimes inadvertently) as adults. They are mouthy as puppies until properly taught bite inhibition. Puppies also tend to have temper tantrums. Similar to baby Grizzly bears! Young dogs require a lot of very good food (poor quality food can cause health problems) SOME young males CAN require as much as 8 - 10 cups of excellent quality food per day, that's 2 - 2 1/2 lbs! When shedding they leave black "mouse balls" everywhere. Young dogs require a lot of exercise and need some form of work (obedience, agility, herding, etc). They can be destructive if bored or improperly housed. They CAN be very dog aggressive especially if not spayed/neutered or if not properly socialized. They play hard and can easily injure someone unintentionally. They also herd children and other animals and can bump, or nip them while doing so without meaning harm. It CAN be difficult to obtain homeowner's or renters insurance if you own a Rottweiler. Rottweiler puppies are adorable little black bear look alikes! They are fuzzy, clumsy and just so cute! However Rottweiler puppies are not for everyone, and just because you've had a puppy of another breed or mix breed does not mean you are cut out for a Rottweiler puppy. This does not mean you are a failure as a puppy parent, it just means you are smart enough to admit that perhaps you should choose a young adult or an adult rottweiler as your companion. 1) Eight to sixteen week old puppies have very little bowel and bladder control. What this means is that the new baby will most likely have to be taken outside to potty at least once in the night, 2 am seems to be a popular time. (If your pup is not used to being crated then it will likely howl for 20 minutes to 2 hours before falling asleep!) These pups also cannot "hold it" while you are gone all day at work (there are exceptions but we are speaking in general terms here). Ideally a human is home at least part of the day to take the little one out every 2 to 3 hours. If this is not possible then a room should be made puppy proof and a crate with the door off in one corner and newspapers on the floor. Baby pups need to potty after waking up, before being put in the crate, after coming out of the crate, drinking, eating and playing. What usually causes the most problems is the playing because they are distracted and then all of a sudden HAVE to go now! When playing with a baby you must take them out every 30 to 45 minutes to avoid accidents. ANY TIME you take the puppy out to potty You MUST wait for them to go both pee and poop even if it takes 30 minutes for them to find just the right spot. They have to go out even during a thunder storm or in bitter winter wind..
2) Biting. Rottweiler puppies are VERY mouthy! They are very bitey and growly until they learn otherwise. They can act very aggressive with certain toys and things like rawhide and pigs ears should be avoided because they just cause unnecessary problems. They also chase down kids and bite their hands and legs and toes, they grab the cats, they bite the older dogs face, they bite your hands etc... Many pups can learn to inhibit their biting by you hollering OWW! really loud every time they bite. Other pups need to be lightly clipped under the chin with an open hand while you say "no bite". REMEMBER if what you are doing does not seem to be sinking in after 4 or 5 times then stop! It just is not working and you need to try something else. Some of them are good all day and become biting monsters after 7 pm. Some of them become little sharks if they don't get enough exercise or people time. Some just need to be taken out to potty and then calmly put in their crate for a nap. This is a perfectly normal stage for a Rottweiler puppy and if handled properly will be mastered by 6 months of age. (then they move on to jumping on people and chewing on your furniture!) It is a VERY frustrating and annoying time and this is one of the things that turn perfectly normal people and even some not very rottweiler knowledgable trainers totally off of rottweilers or to label them as aggressive/dominant etc.. which is certainly not the case! This stage requires TONS of persistence and patience. 3) Rottweiler pups are very smart and this gets them into lots of trouble! They are into anything and everything not tied down. Average puppy proofing of your home will not be sufficient! Anything your puppy should not be into should be protected or placed above 3 feet. Remember if anything gets broke or chewed it IS NOT the puppies fault! It is yours because you did not pick it up or protect it enough. Pups should never be left alone in a room, ever! You can not use the phrase "he should have known better" until he is OVER 2 YEARS OLD!! 4) Rottweilers mature VERY slowly! The housebreaking, crate training and chewing may be over with by 12 months old. But the rottweiler is a puppy til it is 2 years of age! They require AT LEAST every other day training sessions from puppyhood on. They also require alot of exercise. Though rottweilers under 2 should never be jogged or biked they should get lots of play time every day and walking is fine as long as you know the distance your pup can easily walk without getting exhausted. Over tired pups easily injure their joints and ligaments. If your young rottweiler is being especially wild and naughty then it needs more exercise and training sessions. Boredom and underplaying are the two biggest causes of bad behavior!! 5) Rottweilers also mature very slowly physically. This means that they should be kept lean. If they don't have a visible waist or you cannot easily feel their ribs the dog is way too fat! Rottweilers do not finish filling out width wise til 3 or 5 years old! Overfeeding WILL NOT make them fill out faster but will make them more susceptible to hip dysplasia, shoulder ailments and torn knee ligaments. IF after reading all of the above you still want a puppy then by all means get one. But remember the commitment you are making to this dog. You are promising to properly care, train , feed and exercise it while keeping in mind all the above things that make this dog a Rottweiler! Being a breeder, owner, trainer and a boarding kennel manager I get to see or hear about all the problems teenage Rottweilers can bring to a home and all the love and joy as well. Before adding a teenage or preteen (6 months to 2 years of age) rottweiler to your home Please do alot of research. Not only on the Rottweiler as a breed but also into your own lifestyle and expectations for a dog. Teenage and preteen Rottweilers are full of themselves and then some! At about 6 months of age they stop being bitey little fuzz balls and start to really get into trouble! This is the age when they start jumping up on people, getting into the trash and chewing on your furniture. If not trained , played with and exercised enough and if not confined properly when unsupervised they can destroy a home or apt in one day!! I generally recommend that Rottweilers up to 2 years of age (and sometimes beyond) be crated when not supervised to keep them out of mischief. Some of the naughty things teenage rottweilers have done to other people's homes when left loose and unsupervised are: Chewed the corners off 100 phonographs; Chewed up not one but 2 new pairs of shoes; Chewed up every single pair of dirty underwear in the laundry basket; torn the linoleum up from the entire kitchen floor; chewed the legs off the dining room table; dug up and chewed in half the satellite dish cable; taken the vinyl siding off the back side of the house and chewed the wood molding off several places in the home. Amazing isn't it? EVERY SINGLE one of these incidences could have been avoided by simply crating or supervising the young rottweiler. Teenage rottweilers are very intelligent. So much so that it is sometimes a huge burden for the owner! These pups can and do get bored very easily and bored dogs are destructive dogs. The more intelligent the dog (of any breed) the more easily bored and then destructive they become. So if you want a dog that will just patiently lie around your home or yard until you invite it to do something; then perhaps an older well trained rottweiler or a dog of another breed is for you! Teenage rottweilers also like to see just how far they can push the rules and still get away with the behavior! If one day they experiment with a tiny growl when they are eating and people back away, then this encourages them to greater extremes. If they shove you out of the way to get out of the car and you say nothing then they will continue to do that! They learn bad things way quicker than the things you want them to learn!! Going to obedience classes or training the dog yourself consistently and often keeps life in order. Rules are not made for your dog to break. Rules must be set and enforced. Physical force is not required as a rule BUT consistency, fairness and firmness are musts! If you are a really laid back, non confrontational or soft natured person then a Rottweiler ESPECIALLY a teenager is NOT the dog for you! Rottweilers mature mentally very slowly! The housebreaking, crate training and chewing may be over with by 12 months old. But the rottweiler is a puppy til it is 2 years of age! They require AT LEAST every other day training sessions. They also require alot of exercise and mental stimulation. Though rottweilers under 2 should never be jogged or biked they should get lots of play time every day and walking or swimming is fine as long as you know the distance your teenager can easily walk or amount of swimming he can do without getting exhausted. Over tired pups and teenagers can easily injure their joints and ligaments. If your young rottweiler is being especially wild and naughty then it needs more exercise and training sessions. Boredom and underplaying and lack of mental stimulation are the three biggest causes of bad behavior!! Rottweilers also mature very slowly physically. This means that they should be kept lean. If they don't have a visible waist or you cannot easily feel their ribs the dog is way too fat! Rottweilers do not finish filling out width wise til 3 or 5 years old! Overfeeding WILL NOT make them fill out faster but will make them more susceptible to hip dysplasia, shoulder ailments and torn knee ligaments. IF after reading all of the above you still want a teenage or preteen rottweiler then by all means get one. But remember the commitment you are making to this dog. You are promising to properly care, train, feed and exercise it for it's entire life (8 to 12 years) while keeping in mind all the above things that make this dog a Rottweiler! If you have a Rottweiler and find that you can not keep it for whatever reason, DO NOT take it to the animal shelter except as a last resort. FIRST call the dog's breeder, ethical breeders will take back dogs that they have bred. 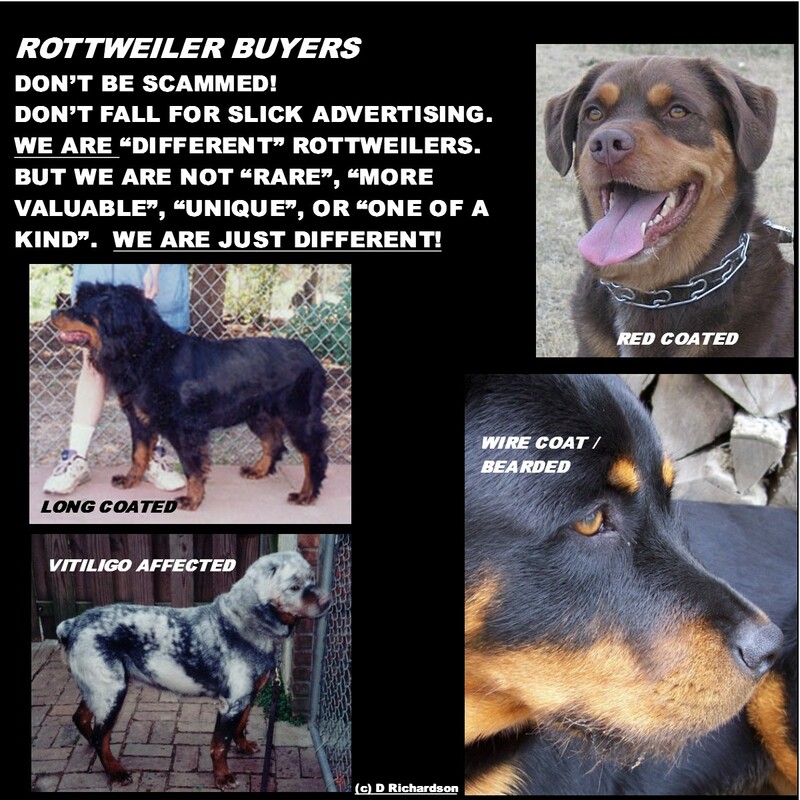 If the breeder for some reason can not or will not take back the dog- call a Rottweiler Rescue. See Rottweiler Links for more information sites. the breeder themselves should seem trustworthy to you. They should be willing to answer your questions and no question should be deemed stupid. They should be a person that you will want a friendship with for the life of the dog AND they should be commited to remaining in contact with buyers for the life of the dog. ALL dogs (Rottweilers) used for breeding (talking dogs LIVING in the US or Canada) should AT MINIMUM have OFA certified hips and a CARDIOLOGIST (or specialist) OFA cardiac clearance (NOT a practitioner one- look at the number C=cardiologist, S=specialist, P=practitioner) . Elbows should be OFA evaluated as well and should not have UAP, FCP or OCD. and DJD rating should not be higher than a 1. Imported dogs that are LIVING and being bred in the US and Canada should have been redone using OFA (hips/elbows) and this is a REQUIREMENT if the breeder is an ARC member. IF the breeder does not ask you a list of questions and seem to screen buyers, walk away. Screening buyers is just 1 indication of caring about their pups for life. ALL purchase conditions and requirements (including what happens to the dog if you can no longer keep it)should be laid out in a purchase contract which you must READ before signing and if it contains anything you do not agree with do not sign it. REMEMBER these are just variations of the breed. They are NOT rare or more valuable. They are just DIFFERENT! Long coated and wire coated/bearded/furnished are both common coat variations in the breed. Dogs with long coats tend to be very soft which is an incorrect coat texture (short coat dogs can also be soft and many -though not all- of these are found to carry the long coat gene). The coat length can vary between barely heavier than average (and discernable ONLY by DNA test!) to Show Golden Retriever or even Newfoundland length. The length of a dog's breeches/pants, neck ruff or belly hair is not a good indicator of carrier status because many lines of normal heavier coated dogs that are clear of the long coat gene entirely can have longer hair in these areas. There is a DNA test for this coat and the results will be clear, carrier or affected. Two clears cannot produce a long coat and as this is a pure uncomplicated recessive gene it takes two dogs with the gene (either carrier or affected) to produce it. Normal coated dogs have 2 normal length coat genes, Carrier dogs will have 1 normal length coat gene and 1 long coat gene, Affected dogs will have 2 long coat genes. Long coat is a TOTALLY separate gene from the wire and a dog CAN have BOTH genes! The proper Rottweiler coat is coarse/hard (as described from the very first breed standard) and the wire coat gene plays a very important role in this. Many dogs carry this gene and the more shed out a dog is the easier this is to feel in the BODY coat. The BODY coat gene is related to the face/chest/leg/foot furnishing gene but appears to be separate- meaning a dog can have a proper hard coat and no furnishing gene OR can have a soft incorrect coat and the furnishing gene OR have both a proper hard coat and the furnishing gene! Historically, the presence of a slight beard, and/or "wire coat" at the brow, mouth line or mouth corner has been thought to be an indicator of proper hard coat and MANY famous historic Rottweilers either actually had a slight beard (Ives v Eulenspeigel for just one example) or were known to throw them (Dack vd Meirei is one). This can in fact be true as both the proper hard, wire like but flat, body coat and the face/chest/leg/foot wire coat ("furnishings") are quite often combined together. Sometimes too though the "furnishings" are so very light that they are visually unseen or the dog simply does not visually have them. There is also a very uncommon "full" or "extreme" wire coated Rottweiler. This dog has the hard, coarse coat but it is not a proper flat coat. It stands off the body (a little or a lot). It may or may not have grey (salt) hairs scattered. This is accompanied by full furnishings (furnishings appear in one or more of these locations: beard, mouth line/mouth corners, near canines, above eyes at brows, nose bridge near eye corners, under eye, cheeks, chest, feet, toes, backs of legs), although they may vary in length with some full wires having quite long furnishings and in some other's the furnishings are longer in some areas of the body while barely seen in other areas. IF a dog will be bearded or have other visible furnishings, it usually does not appear until 5-6 months of age. The wire furnishing gene can be all but invisible, Or the dog can have a slight , moderate or heavy furnishings in 1 or more locations. See the wirecoat page for full details, information and modes of inheritance as well as info on using DNA testing. In general the "theory" that red/tan (and maybe blue/tan) Rottweilers "could" exist is valid. because Rottweilers and Greater Swiss Mountain Dogs are very closely related and blue/tan and red/tan occurs with frequency in some lines of GSMD. HOWEVER the reality is that since the mid 1900's the Rottweiler has been bred solely for black/tan discarding all other base colors including sable. That said it is "possible" that some older lines "could" harbor the recessive blue/tan or red/tan (but NOT sable as that is a dominant) and I have in fact seen red/tan dogs out of both import and domestic parents. HOWEVER unless there is DNA proof of both the parentage of the litter AND the parent's parents, I am inclined to believe the pups are more likely mixes between GSMD, Doberman or other breed where those recessive colors are far, far, far more common. In almost 30 years in the breed dealing with both US and Euro/import lines I can tell you that I have seen/heard of exactly FOUR verified purebred red/tan, ONE blue/tan and one black pigmented white. That is it! In verified Rottweiler parantage occurances, these less common recessive genes only occurs in a few lines. Both parents have to carry the gene for it to appear. Off color coated dogs should never be bred as these colors were removed (as best as possible) from the breed towards the beginning of the breed history. Dogs affected with Vitiligo are NOT blue merle. NO merle gene exists in the breed, nor EVER did. Dogs with vitiligo (as in humans) have an autoimmune disorder that affecteds the pigment cells. Rottweiler Purr/Grumble. What it is and is not! ALL of these can be expressed by both a happy, aggressive, stressed and upset dog except the whoo and singing which are almost singularly happy noises. Right off I'll say Rottweilers do NOT purr. NO DOG does. They are physically incapable of purring. Rottweilers also grumble in conversation to tell the person touching them that they don't feel like doing this right now, or they are in a pissy mood or the person is approaching a limit line. Some Rottweilers are just grumpy about everything and "discuss" it the entire time you are doing whatever - these dogs are called talkers. The body language in these cases is slightly different. The eyes might be staring straight ahead but open, the head may be turned away, the body may be slightly (or more) stiff, the ears may be back. I am saying you must know your dog and their body language and know what they enjoy and what they dislike or find stressful. Some dogs LOVE hugs, cuddles and laying with their owners head on their sides while others find that to be far too much social pressure and it stresses them to the point of snapping and still others think such things are way over what they consider acceptable liberties. When purchasing a new dog or puppy, make sure you and the person you are obtaining this dog/puppy from follows the laws, even if the dog/puppy is free or a gift. If obtaining the dog/puppy from someone (breeder OR individual) within your own state, then make sure you know what laws your state has regarding such transfers. If obtaining the dog/puppy from an animal shelter, make sure you know where the dog/puppy originated from as in many cases dogs/puppies that originate from another state have different paperwork requirements and different health risk exposures than those originating from inside your state. If obtaining the dog/puppy from a rescue group, again make sure you know where the dog/puppy originated (for the reasons above) AND make sure the rescue group is properly licensed in the state it is based in. If obtaining the dog/puppy from OUTSIDE the U.S. make sure you know BOTH the laws of your state regarding the importation of a dog/puppy AND know the Federal laws regarding importing a dog/pupy from another Country. The FEDERAL laws changed in August 2014 making this more complex! Below is an abbreviated law overview for the state of New Hampshire as well as some links for puppies/dogs originating from outside the U.S (including those from Canada). You must be licensed by the state of N.H. even if there is no physical facility within N.H. when the transfer to the final owner occurs in N. H. This applies to brokers, commercial kennels, shelters (and rescues) and pet stores.